Monday morning, it was crisp, cold, and the ground was pretty frozen. 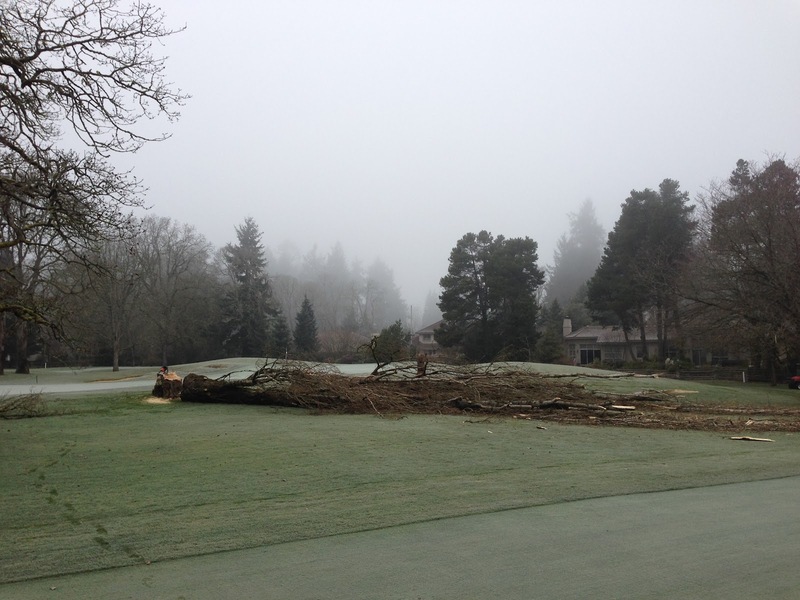 Perfect conditions to dispense of the two poplar trees on 13 green. Kevin swiftly dropped them with amazing precision and then the entire staff efficiently processed them. Within hours, only two stumps remained and that's were we still are on this project. 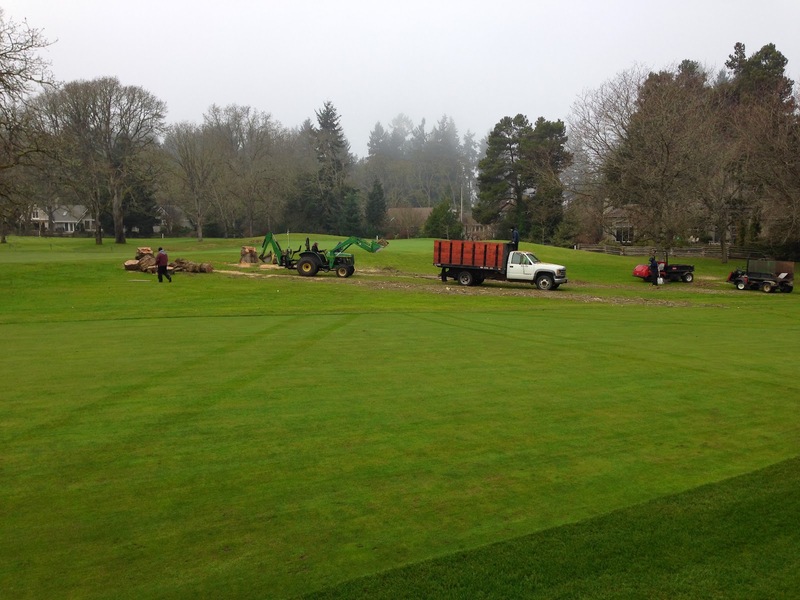 This coming Monday we are scheduled to grind them out and then begins the job of chasing all the shallow roots with the backhoe in order to begin the restoration process. When this area is completely restored it will be a large extension of the fairway on 13 and connected to the fairway on 12. There will be some fun, challenging recovery shots made from here. Tuesday, we began sodding behind #2 to complete the restoration of that area and today that is now complete and looks awesome. Balls that just trickle over should come to rest on the short turf were (as we all know, since we've all been there) a difficult to near impossible up and down will be attempted. The six inches of sand we put down here allowed us to regrade the area and make it smooth enough for the closely mowed turf and it is going to work well to keep it firm and dry. It's a rather shady area so in the past it was always pretty damp here so I look forward to seeing the new condition and improved play ability. 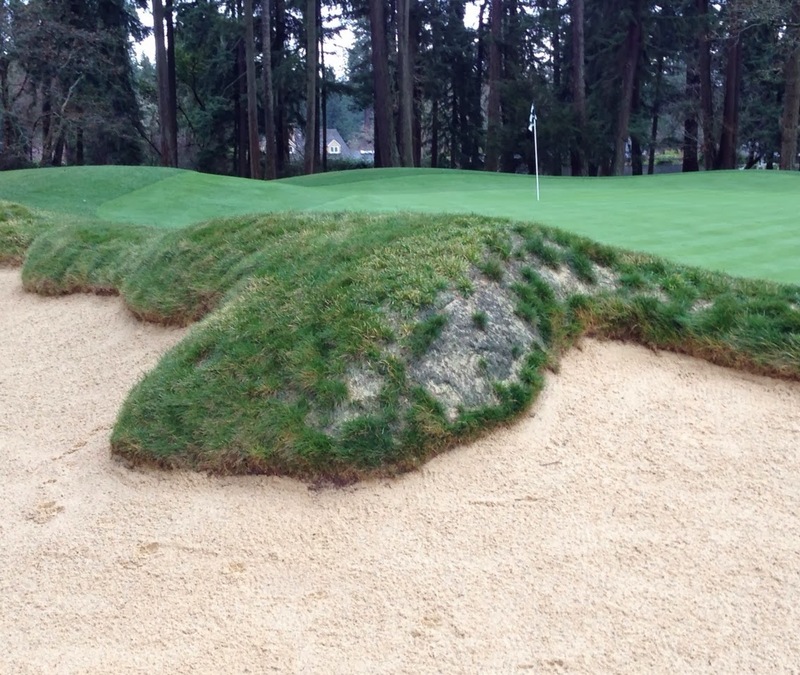 You won't be seeing the burned out areas on the bunker eyebrows much longer. 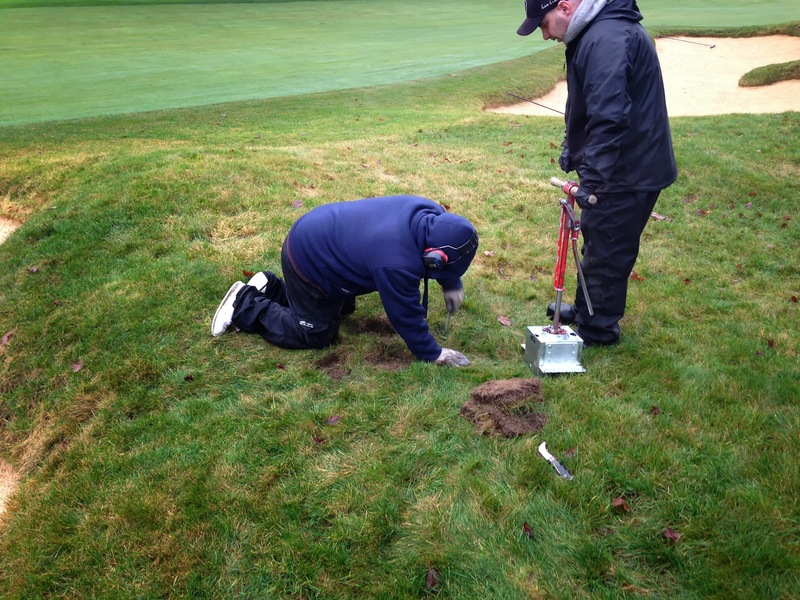 This week we began the "Rescue the Fescue" project. Basically we are removing fescue in some of the flat areas and transplanting it to the vertical areas because seeding something that is vertical is very difficult (and I don't have the patience care for fescue seedlings all winter). 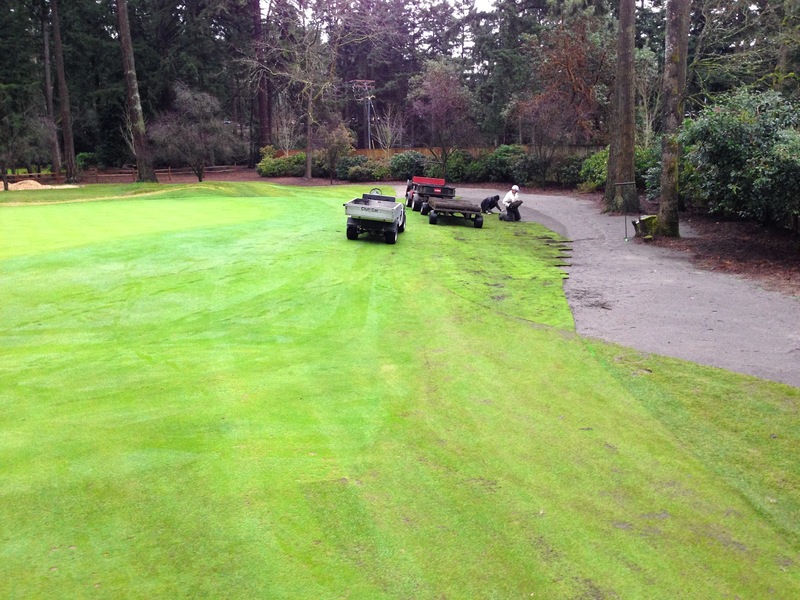 The flat areas where we are removing fescue can easily be reseeded in the spring. Below you see the bunker on #1 as we got started. 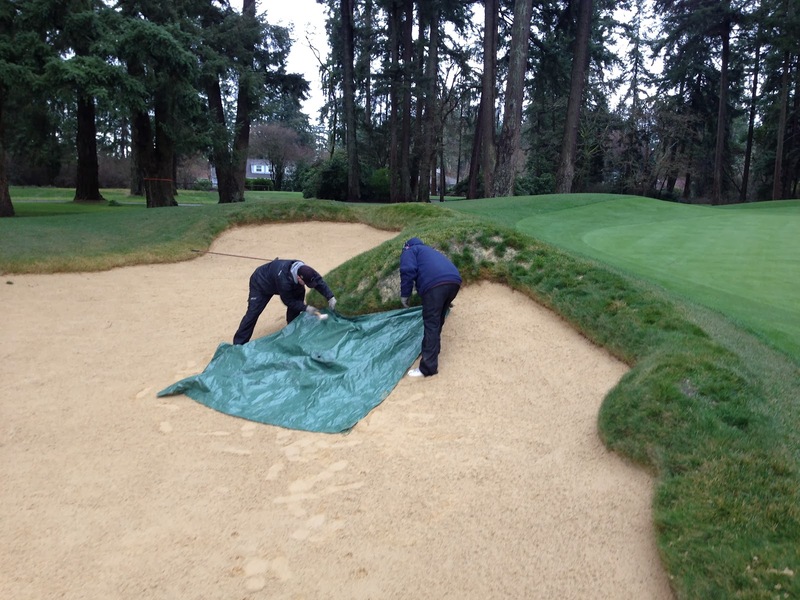 Some preparation is necessary before the surgery begins to ensure that no soil drops into the bunker and contaminates the new sand. First, any remnants of the old sod is removed to expose the bare soil. 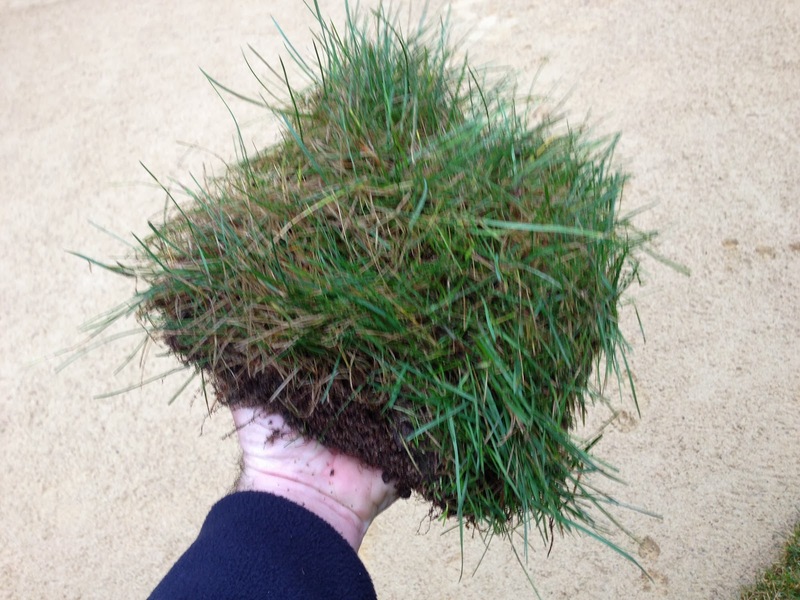 Then the little chunks of fescue are carefully stapled to the burned out areas and the end result is quite remarkable. I know the skill of the staff is exceptional but the way this is turning out just far exceeds my expectations. 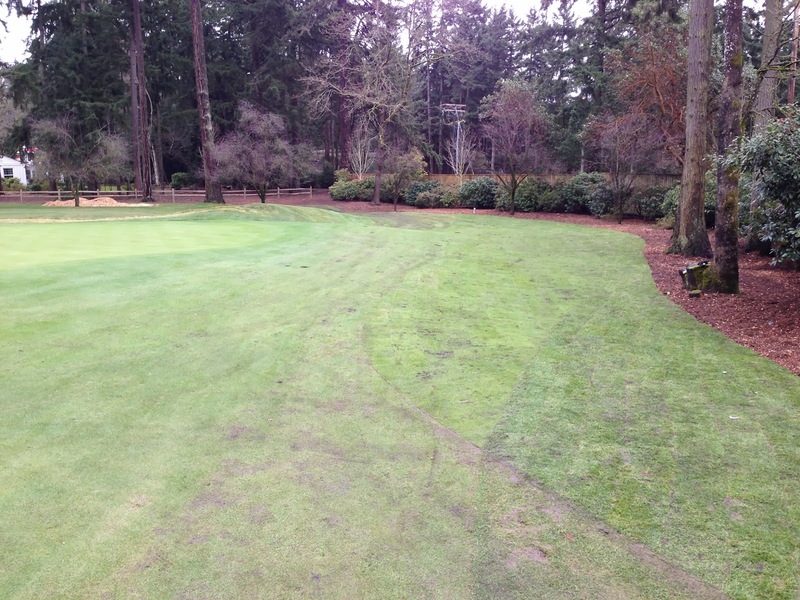 Check out that same area on #1 green after the process is finished. 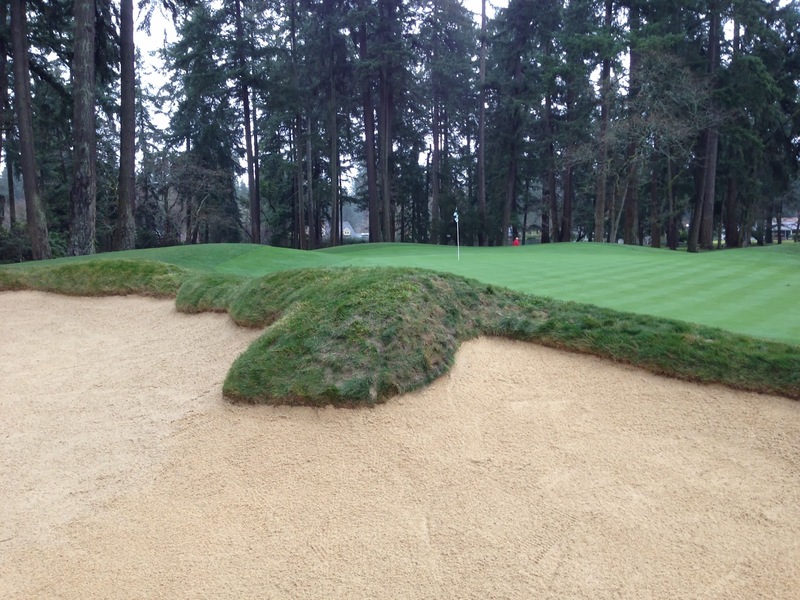 Remember that bunker on #8 at the end of summer? Below you see it today after the guys made repairs. 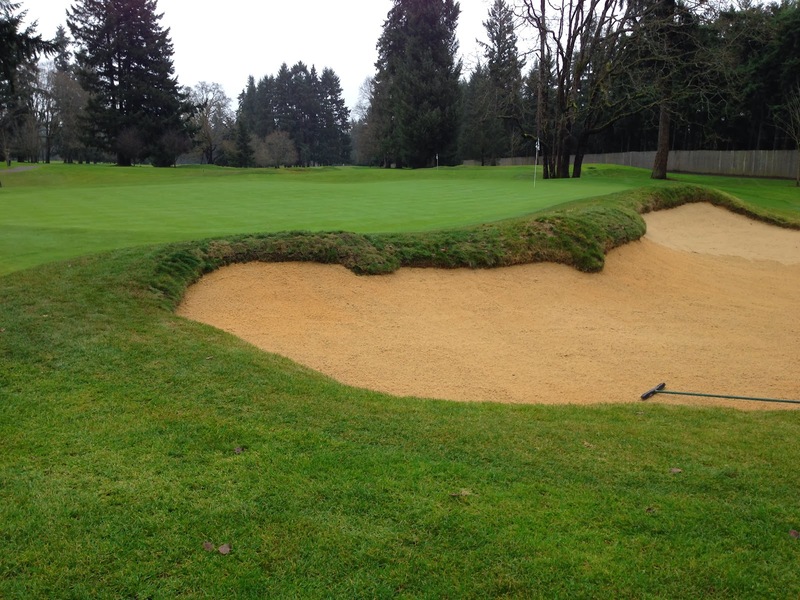 I'm very excited about fixing these bunker eyebrows. I have no doubt that since we are getting an early start on this, the sod will have ample time to establish and we shouldn't see any future burnouts to the degree that we saw during this first year of the new bunkers. Hey, if your out there this weekend, check out the ball washer on #11. 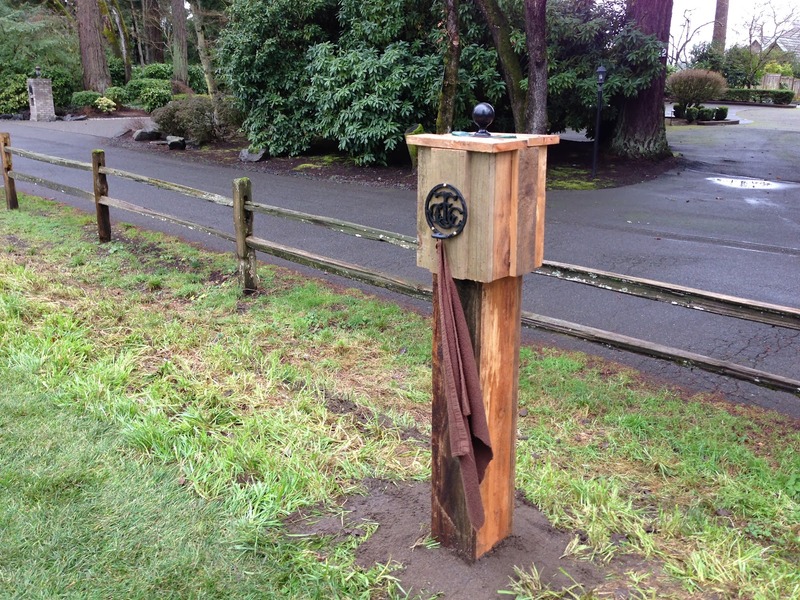 This is a regular Par Aid ball washer but we shrouded it with cedar fence boards. We are very proud to be one of the first 90 clubs in America and ever since we began the restoration, I've been thinking about ways to make the place look representative of the year 1894 when it was founded. I don't know what a ball washer might have looked like in 1894, but I'm guessing there wasn't such a thing at all and folks just used good old spit and a towel. Anyway, if there was any ball washers in 1894, maybe they were made of wood and look something like this. Let me know what you think.